Enchanted Forest. Deep green creme. The star of the collection, in my humble opinion. It's just too gorgeous. The sunlight picture washes it out slightly, but it's a rich, dark green that doesn't look black! Before you ask, it's absolutely nothing like Nars Zulu. But it is super beautiful, deep and dark but not too dark. It's a little more on the blue side rather than the yellowish side. Happily Ever After. Medium red purple shimmer. This is an unusual color- it's a very dark pink or perhaps and extremely red-toned purple. It reminds me of beet juice, actually. It has a very subtle but very interesting bright pink-purple shimmer. Much, much prettier in person- my pictures don't really capture the play of shimmer against base color. Pixie Dust. Shimmering grey. This is so cool! It's a very light blue-leaning grey creme with little glassy flakes of shimmer. They look like broken glass on cement. Fascinating to look at. Poison Apple. Red-Orange creme. This is pretty similar to SpaRitual Intrigue. It's a very, very orange-toned red... I'd almost call it more orange than red. It looks more red in some lights, more orange in others, but I'd say the overall tone of the polish is a rich orange color. Prince Charming. Taupe-brown creme. I love these types of colors. I'm glad they have been so popular the past couple of years! This is a little lighter than some of the other taupe-brown shades out there. It's really milky looking, almost chocolatey but heavy on the grey. Really cool. Mirror Mirror. Very light grey creme. Of course, I had to stick my finger in it while the polish was still wet and then try to cover it up with another coat of polish... That didn't work so well... Please excuse the giant smudge. Anyway... This is a plain grey cream, slightly blue-toned. It's much lighter than the other grey cremes in my collection, lighter even than Illamasqua DWS. The formula on these was pretty good. I normally find Orly's formula to be pretty thick, but these are much more thin and even than a lot of old Orlys in my collection. The opacity on all of them was very good- two to three coats each, I did three coats just because. The drying time is a little bit longer than I like, but not quite as long as some of my old Orlys. They must be tweaking the formula, and if so, I like it! Overall, I love this collection. Nothing too wild or crazy, but still full of colors I adore. Grey, green, murky taupe. I love the fairy tale theme, I love the cute names (even if they don't seem to match perfectly with the colors). I'm thrilled to bits about Enchanted Forest especially. Thanks for the swatches - EF looks great. Great swatches, I'm so going to have to get Enchanted Forest and Pixie Dust. WANT WANT WANT all of it! I rarely want an entire collection. I think this one wins for me! And LMAO at what it reminds you of. Awesome Rammstein reference! Ever seen them in concert? They are amazing! Holy mutter I love Enchanted Forest and Pixie Dust! Great pics as always Scrangie! Love the post, the polishes and especially the video- Rammstein always rock! Prince Charming is going on my list to buy lol. I'm definitely getting Enchanted Forest and Prince Charming. Oh I so want that green! Thanks for the lovely swatches. PS: Are you indeed a Metallica fan or? I love how much variety is in this collection, there seems to be something for everyone! I am excited to check out Enchanted Forest myself! Thank you for swatching and sharing! TRY MATTE ABOUT YOU OVER PIXI DUST!!!! i love enchanted forest!!!!.. can't wait to get it! i hate the greens as of late that don't look like green (dark room) or one's that are sooo dark you cant even tell it's green. its no zulu, but i still love it! Oh, I've been lemming Enchanted Forest since the first time I saw it! GORGEOUSNESS!!! This may seem strange, but I've never tried Orly before. 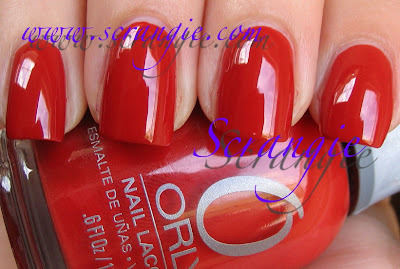 I always seem to just walk on by to a different brand, but you've got my attention now Orly! I neeeeed Pixie Dust and Enchanted Forest. Oh yes. I need to own that green. 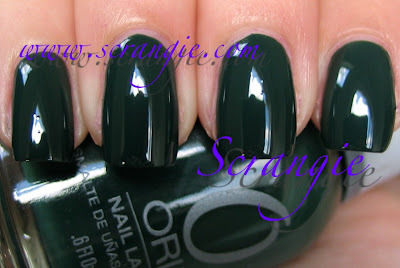 I've been drooling over the OCC dark green cream but haven't been able to spend that much on one nail polish. This is going to be my substitute! OMG is that Michael Jackson in a Snow White dress? Hee I loved this collection too. I didn't get the purple or the red because I thought the other 4 looked so great together lol. I'm wearing Mirror, Mirror matte right now! I remeber using parts of that image to make a t-shirt before seeing Rammstein in concert. It was awesome by the way. Lots of flame throwers and sfx and whats not. They haven't been to Norway since... But the memories, oh those memories. And I do agree, the slight darkness of this collection surely hints at the lovely twisted thing that is Sonne. Scrangie, thank you so much for putting my blog on your blogroll, it makes a difference already! Zulu or not the dark green is a beauty, also like the steel blue-grey and the shiny eggplant creme. Thanks for the swatches! BEAUTIFUL. How would you feel about swatching Pixie Dust and Mirror Mirror with some other grays sometime? I'd love to see how they compare with, say, Zoya Harley on the blueness front, you know? I think I'm going to need at least the first 3 polishes if not the entire collection! Ha, I bought Prince Charming from my Sally's back in May, and wondered what the heck it was. Now I know! Excellent collection. Looks like I'm gonna have to get Orly's Enchanted Forest. I blame Nubar's Forest for making me obsessed with green cremes! When will nail-polish companies learn to put more of these colours out? Enchanted forest is something. I'd like to take adv of this to ask you in yr opinion what's best strengthener. Tired out of having short breaking nails. Thanks for the help. Are these Orly shades out already? If so, where can I get them?!? I bought "Enchanted Forest" because I loved the way it looked on your blog and yay! It's the dark green I wanted OPI's "Here Today, Aragon Tomorrow" to be. Deep dark green but not to dark that it's black. I'm waiting for it to dry... Hope it doesn't take as long for me as it did for you.